Terra Traditions 4x6 Photo Album - Baby Content (Blue) This baby photo album from Italian-style artisan studio Terra Traditions is a carefully crafted photo album to help you treasure cherished memories. Through a lamination process, the classic imagery is applied to this beautiful linen cover. This baby photo album is made with photo-friendly Kraft pages and acid-free insert sleeves, and they come in a Kraft paper box for storage or gift giving. This baby album is sized at 9"x9" and holds 200 4"x6" photos (2 per page). 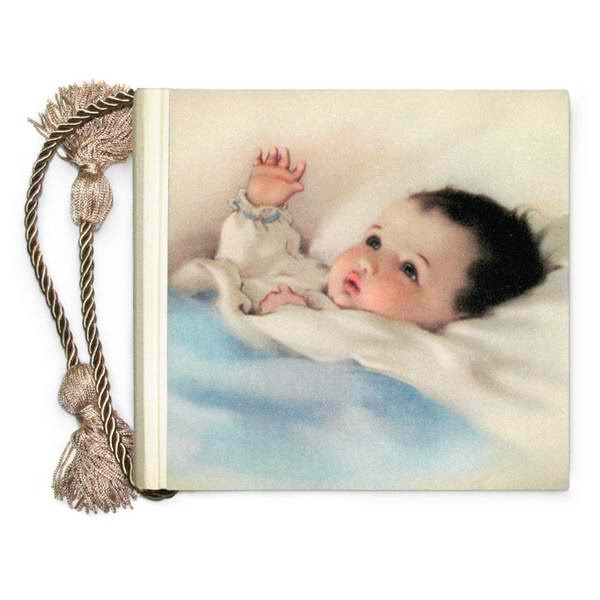 It's a baby photo album that will never go out of style and makes a wonderful accessory to your Terra Traditions baby record book, also available at BabySakes. •Holds 200 4"x6" photos •Acid-free insert sleeves •Photo friendly Kraft pages •Album Size: 9"x9"